Expired Win Dermalogica for a Year! Cult brand Dermalogica is the number one selling professional skincare in more that 80 countries. See below for entry details. 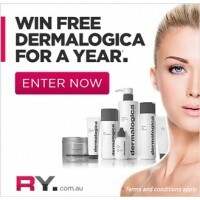 Ry.com.au – Australia’s largest online beauty and hair care store are offering one hell of a prize as we enter the warmer months. Up for grabs is one year’s supply of Dermalogica skincare. As an authorised stockist of Dermalogica, Ry understands why the cult brand is the number one selling professional skincare in more that 80 countries. Ry will select the lucky winner by chance. You may only enter via the online form once but can increase your chances of winning by sharing the competition on Facebook, Twitter or Instagram using the hashtag #rydermalogica. The competition closes November 13th and will be drawn November 14th. The lucky winner will be notified via the below social channels. Ry.com.au stocks over 8000 beauty products from the world’s biggest brands at the best prices guaranteed. With over 1 million products already shipped, it is no wonder why Ry has become the leading online store within Australia.